For some women, especially those that like wide rings, one ring on a finger is enough so they combine their engagement and wedding rings. 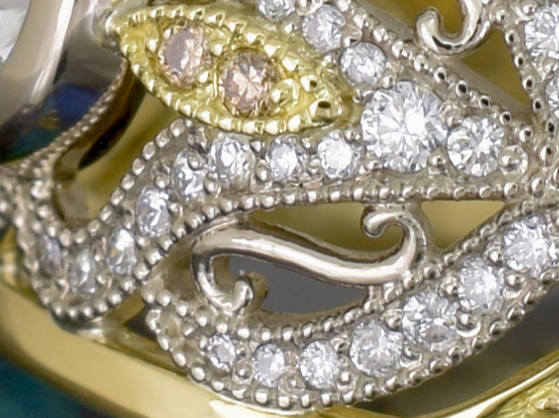 The combination ring I am going to share with you today also displays the very popular design feature "Millgrain". The English word grain is derived for the Latin word "granum" via Old French. In the context of jewellery a grain is used to describe a small bead or sphere. When we combine the Latin word for a thousand "mille" with the English word "grain" we get millgrain. Literally a thousand grains. In jewellery we seldom if ever use exactly a thousand beads so the word is more generally used to refer to the use of multiple combined beads in jewellery design. Millgrain is usually applied to the edge of metal work. Millgrain was first seen in Asian jewellery over a thousand years ago but is usually associated with antique jewellery. Recently we have seen a resurgence in the popularity of this design feature. One of the biggest challenges with designing an engagement ring is planning for the wedding ring. This is especially the case when a straight wedding ring is desired. If the engagement ring is quite wide or low this can also cause issues in getting that wedding ring to sit nicely beside the engagement ring and to compliment it at the same time. For some women rather than trying to make two rings match and sit together they make one ring that serves the purpose of both. The ring I am going to share with you today is a great example of both millgrain and the combination ring. The ring features the use of white and champagne diamonds set into 18ct yellow and white golds. For those that are interested in the design process used for this ring please keep on reading. Making the design her own. removed the diamonds from the outside gold bars to make the ring more durable for every day wear. With the general layout of the ring confirmed we reapplied the millgrain edge and started to look at how the ring would appear on the customers hand. Once the top view was pretty much confirmed we could then start to look at how the ring appears from the side adjusting heights as desired. With the digital design approved a silver draft was made so that my customer could try it on and confirm all the details of the ring before making the actual ring. All ring shapes have a different feel on the finger so the draft not only allows us to confirm the design but also for us to modify the finger size until it is just right. We can then make the real ring to the perfect finger size. If you have ever wanted a piece of jewellery featuring millgrain or any other design feature please contact me to arrange a time to meet and explore some design options.